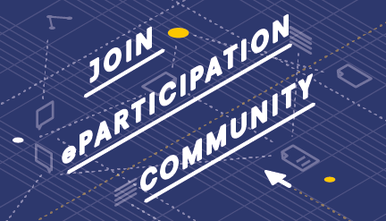 When speaking about eParticipation, we do not only speak of the willingness of institutions to promote and preserve forms of participation by its citizens, nor only of citizens’ commitment, civic sense and responsibility in taking part in the political process, but also about the basic tool through which eParticipation is made possible - that is, the Internet. In fact, although we tend to take it for granted - particularly for young people, who were born in the information age and for whom the Internet has always been part of the world as they know it - the World Wide Web is something that is continuously being adjusted, regulated, and secured. Among the many organizations that work to make the Internet free and accessible to everyone, Internet Society (ISOC) is one of the biggest communities dedicated to Internet development. Founded 25 years ago by people involved with the Internet Engineering Task Force (IETF), through the creation of a number of “Chapters” around the world, which bring together multiple members and stakeholders in local and regional groups, organizing activities and events aimed at informing and educating the public about Internet-related issues, ISOC works to achieve its mission to have an open, globally-connected, secure, and trustworthy web - in short, ‘the Internet for everyone’. Over the last year, ISOC has worked on a yearly report that gathers views and considerations about the current state of the Internet from a 360 degree perspective, the Global Internet Report 2017. In it, members of ISOC have provided their views and knowledge about the evolutionary trends that the Internet faces nowadays, pointing out the main drivers of change and areas of impact for the future of the Internet. The drivers range from the increasing relationship between the Internet and the physical world (the rise of smart digital devices, the Internet of Things and smartphones changes the meaning of ‘being online’ very quickly), cyber threats (the deepening of a digital divide between those with the resources to face these threats and those who don’t, poses a number of issues related to security), and the Internet economy (where those who are on top of the technological changes will be leading innovation and entrepreneurship). The role of governments (who are usually ill-equipped to keep up with the technological advancements and the challenges that come with them) is another important factor. These are the factors that will shape the future of the Internet, the way it works and especially how it is going to affect society, therefore representing essential challenges to be dealt with by all involved - stakeholders, governments, and citizens. 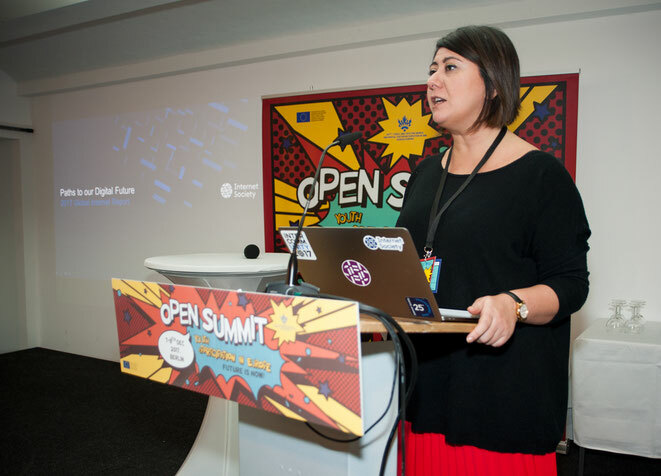 As a matter of fact, “the future of the Internet will shape the future of eParticipation”, explains Ceren Unal, European Chapter Development Manager at Internet Society and Master of Laws in Computer and Communications Law from Queen Mary University, who was a keynote speaker at the EUth Open Summit. In fact, Unal explains, whereas technology increasingly facilitates eParticipatory platforms usage, these advancements also bring forward challenges and risks, especially in terms of security. “Of course, having easier tools to eParticipate is a good thing. There is no need to participate directly in a debate in the Parliament to make your voice heard - in a tweet you can say anything, and it might have an impact, just like on Facebook groups or Change.org campaigns” she says. “On the other hand, verification of identity is a problem. 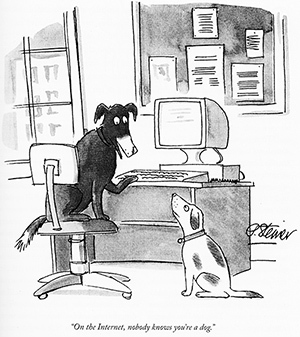 In the ‘90s the New Yorker cartoon ‘On the Internet, nobody knows you’re a dog’, which addressed the anonymity that the Internet allowed, became famous. In 2015, a new one came out - ‘remember when, on the Internet, nobody knew who you were?’, to highlight how times are changing”. And yet, more than twenty years later, the original cartoon remains as relevant as ever. Associating digital identities to real people is, in fact, becoming increasingly crucial for a healthy and effective functioning of the Internet altogether. Specifically, identity verification is central not only for security reasons. Unal reminds how cyber-attacks and data breaches have grown substantially in the last years, hence making it crucial to develop a ‘security by design’ kind of approach when developing any Internet-based appliance, but also to ensure that eParticipation is well performed. “This is one of many challenges”, the ISOC chapter manager points out. “You need to participate and make your voice heard in a secure network, so that no-one can intercept your message to use it or change it, manipulate it…. swelling the ranks of the now well-known fake news”. What’s the solution to this? Unal believes, in general terms, the remedy to solve all these challenges is univocal, and lies in a very human and basic sentiment: trust. Specifically speaking about eParticipation, she says: “You need to have trust on so many levels - you need to trust that your free speech is going to be granted, that you won’t be threatened, that your privacy or security is not going to be violated - so you need to have trust in the system, in the government, in the Internet as a whole... only when you have that you can actively participate. Many people will be reluctant otherwise”. 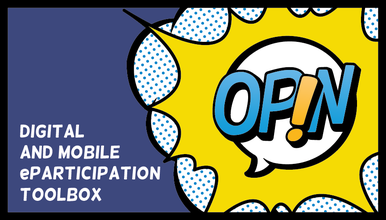 The question of trust constituting a necessary precondition to make eParticipation work is not a new idea on this blog, especially with regards to young people. Stories such as the participatory budgeting project in a high school in Milan have suggested that, unless the participants see that the outcomes of their participation are being enacted, they will lose motivation to participate and “trust” in the process. Along the same lines, the recently published interview with sociologist Brian Loader points out the risks of having a youth who is disillusioned about the political system, hence being more prone to listen to populist claims aimed at subverting democracy rather than making it work. “Yielding trust is one of the main pillars of our work, together with access. Unless you have these two elements, the eParticipation will not be meaningful” specifies Unal. At ISOC, she explains, the various chapters work on promoting the already mentioned ‘security by design’ approach - something which, she points out, they also like to call ‘trust by design’. “We work on A.I., we work with issue policy papers and try to raise awareness generally” she recounts. But ISOC also has programs specifically aimed at involving young people, such as the ‘Next Generation Leaders’ project, where young ambassadors from all over the world are selected to take part into the Internet Governance Forum, joining discussions about the Internet governance on a global level. ISOC supports these young people through funding and various types of grants, and they also offer some online courses to prepare for the ‘Next Generation Leaders’ program. Unal stressed that the organization's chapters are undertaking challenging, yet incredible work around the world: "My view is that the more young members you have, the more active and successful the chapter is. So engaging young people in ISOC activities is definitely a priority” Unal declares. An active and positive Internet policy-making is essential to ensure effective eParticipation. “Meaningful eParticipation is reliant on a secure, resilient, open, free and trusted Internet” Unal concludes. “Governments are ill-equipped to address the challenges that the future of the Internet poses. That’s why civil society should be involved in decision-making process, and especially young people. Provided that they are born into the digital landscape, it’s only natural to work to make youth eParticipation happen. With the right skills and knowledge, they can then become truly empowered and shape their own future through eParticipation”.